Some people wait all year for corn season, and for good reason! Canned and frozen corn simply cannot compare to the flavor and texture of fresh corn straight off the cob. Still, plain grilled or roasted corn can get dull after a while. If you’re looking for a new twist on corn, give this fresh and exciting corn salsa a try. Sweet and savory, refreshing and just a tad spicy—this salsa has a little bit of everything. Make it with our simple homemade pita chips for a spectacular summer salsa scoop! This is a delicious, late summer recipe that is good to have on hand when you want to impress your friends. The ingredients are simple and fresh and the recipe is easy to prepare. The smoky, spicy salsa is lively and really makes the dish. While it’s best to use a cast iron skillet, any frying pan will work, just let the corn cook until it starts to stick to the skillet if you’re not using cast-iron. If you are cooking for less than four, this dish makes great leftovers including a delicious sandwich on a crusty French bread or quick and easy quesadillas. Cook white part of scallions in butter with garlic, 1 teaspoon salt, 1/2 teaspoon each cumin and chili powder, and 1/4 teaspoon pepper in skillet over moderate heat, stirring, until scallions are tender, 3 to 4 minutes. Remove from heat and stir in corn, tomatoes, and jalapeños. Combine remaining 1/2 teaspoon salt, 1 teaspoon cumin, 1/2 teaspoon chili powder, and 1/4 teaspoon pepper and sprinkle on both sides of steak. Grill, turning once, until an instant-read thermometer inserted horizontally into thickest part of meat registers 130°F, 18 to 20 minutes total for medium-rare. Transfer steak to a grooved cutting board and let stand 5 to 10 minutes before slicing. 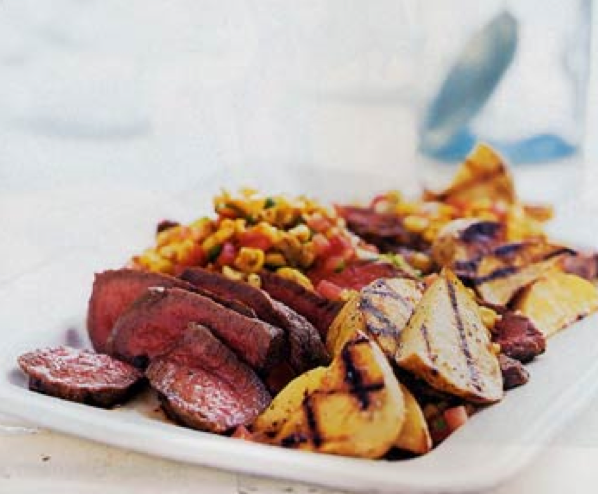 Spoon corn on top of sliced steak and pour over any accumulated juices and serve.